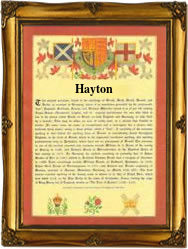 Hayton is of Anglo-Saxon origin, and is a Northern English habitational name from any of various places so called, in Cumberland, Yorkshire, Nottinghamshire, and elsewhere. It is derived from the Olde English pre 7th Century "heg - tunn", meaning "The hay Farm". In the circumstances, the Coat of Arms of three black bulls passant, on a silver field, is an accurate reflection of the agricultural origins. The first recording as a placename was in 1190 as Heiton near Brampton in Cumberland, and in 1240 as 'Hayton' in the West Riding of Yorkshire. Early examples of the name recordings include Adam de Hayton of Nottingham in the 1202 Pipe Rolls of the county, Henry de Heiton in the subsidy rolls of Leicester in 1327 and Robert Hayton of Yorkshire in the Calendar of Inquistions for the year 1415, in the reign of the famous King Henry V. Other interesting recordings include the christening of Annas Haton (male) on April 9th 1581, at Holme, Cumberland, whilst on April 18th 1591, Nicholaus Hayton and Margat Knobley were married in the same parish. Later, but still illustrating the erratic nature of surname spelling even into (relatively) modern times, is the example William Hayton who was born at Topcliffe, Yorkshire on December 20th 1802. He is believed to be the same William Hayton, also recorded as 'William Ayton', who with his wife Mary lived at West Tanfield, Yorkshire, where they had three sons, William, John and James. James, the eldest son being born on July 3rd 1830. The first recorded spelling of the family name is shown to be that of William de Haitun, which was dated circa 1147 - 1154, in the "Charter Rolls of Yorkshire", during the reign of King Stephen, known as "Count of Blois", 1135 - 1154. Surnames became necessary when governments introduced personal taxation. In England this was known as Poll Tax. Throughout the centuries, surnames in every country have continued to "develop" often leading to astonishing variants of the original spelling.